As usual, the annual meeting for the Italian audiophiles is the Top Audio & Video Show in Milan, a must-see event that usually takes place in September, slightly before the London HiFi Show. Milan is one-hour (by plane) away from where I live (a sunny island in the Mediterranean Sea...) so, after a short (yet expensive :-( ) trip I was ready to put a PRESS badge on my jacket and start "browsing" the Milan Show. Then consider that this year the number of mid-small Companies has been drastically reduced by the organizers in order to leave more room to the big guys. As I always say, the Top Audio & Video Show is the best way to get an idea of what's happening in the Italian HiFi market: when HiFi doesn't sell well even the smallest Companies can embarrass the big names...that's business. Oh well, new audio format, that is! DVD-Audio or SACD? This was the main question at the Show. As scheduled, several DVD versus CD versus LP versus SACD versus anything comparison tests were available into different rooms. The results have been confusing, to say the least! One thing is clear to me, though: it is just a marketing war, nothing else. Sound quality doesn't really matter here. We all know this has already happened...do you remember the CD against LP comparisons during the mid 80s? It is happening again. A new media for audio was needed because the CD sales were dramatically going down. A new media was needed because the royalties on the Compact Disc format are going to expire very soon. Hence, a new perfect digital format is introduced and the audiophile crowd starts debating the pros and cons of the new formats: DVD sounds better than SACD (or viceversa) and both sound better than the old poor sounding CD. The LP seems to score (still) high in the audiophiles' preferences, though. This is just ridiculous. We can't decide ANYTHING. The winning format will be the one that will get more support from the recording Companies, period. We can discuss, flame each other, compare ad libitum, consuming our ears (and patience) in order to find the tiny difference between the two formats and NOTHING will change at all. So, please, stop debating, sit down and wait. A new digital format will arrive anytime soon at a dealer nearest you. By now, the DVD-Audio isn't available yet: the DVDs you may have heard (such as the Chesky's) are nothing else than DVD-Video with a blank video section and a 24/96 audio. The DVD-Audio should have a 24/192 standard. And there's NO software available yet (and no players, actually). The same applies to SACD, which will be (perhaps!) available in late Fall or early Winter and it is not sure even if a SACD will be readable by old CD players as claimed. So, put away your VISA and close your wallets...and wait. Sadly, some DVD-Ready amplifiers were already available...do you still remember the CD-ready amps and loudspeakers, don't you? It is the same old game, again. Don't believe the hype! It is should be clear to everyone that high-resolution digital audio will be better than the 16/44 CD format...BUT!!! Surprise, surprise... while attending the 24/96 DVD versus 16/44 demonstration tests at the Audiophile Sound (a software mag) room, the gap between the old CD and the new DVD wasn't sooooo CLEAR and sometimes I (and other reviewers) preferred the sound of the CD (aaaargh!!!). This means that there's a difference, normally the high resolution formats sounds better but you need hi-$$$ equipment to experiment that difference. This hi-zoot stuff was actually available into the Audiophile Sound room, where two HUGE Be' Yamamura horns were used for comparison duties, besides the pletora of hi-end electronics driving them. Unfortunately the room was very large (and crowded! 150-something) and just acoustically "fair" so the differences were audible but there was nothing particularly exciting or heart-shaking. 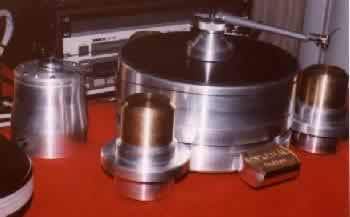 This turntable (see picture above) is the cheaper - 9,000 $ - version of the unbelievable Atlantis we described last year. 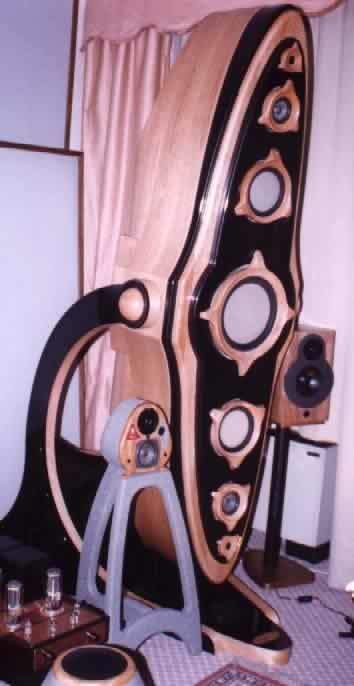 Besides the Indian, there were available a pair of full-range horns by Be' Yamamura (partially visible, as they were really HUGE, in the picture below) and a smaller bookshelf equipped by a Fostex-fullrange driver, deeply modified by Piantini. The cabinet, as you may argue from the picture, is made out of pure cork. Pierre Bolduc (Audiophile Sound editor) was the chairman and the official speaker of the demos. And if you were thinking to go out and buy the first DVD machine out there because you can't live without the 140 dB S/N ratio well, think again. Probably your money is better spent on a new pair of hi-resolution (now that makes sense!) loudspeakers or on a new amp. Actually your loudspeakers may have 3% of THD and your amps a miserable (when compared to 140) 90 dB of signal to noise ratio. Matter for thought, isn't it? And please, don't start complaining about the HiFi magazines with the old story of us being "THE opinion leaders" here. There's NOTHING we can say or do about DVD/SACD war that will change the events. We're writing for a niche market, the BIG guys simple don't care about HiFi magazines. They want the consumer crowd's blood and bucks. Still in the digital domain :-) there were some other interesting hot news at the Show: for example (even if not a World premiere) there was a system using the already famous DCS upsamplers. What is an upsampler, I just understand oversamplering... It's that easy: a (digital to digital) device that samples again the digital 16/44 output of a CD transport (or DAT) and converts it into a 24 bit/192 kHz signal. Then you need a D/A converter able to treat a 24/192 digital signal and convert in into analog to feed your amplifiers. I can hear you asking why. One of the possible (and easiest to understand) explainations is the following: the upsampling helps to reduce the quantization noise and hence the overall distortion. I can't say if it works or not since the upsampler was permanently connected to the ysstem making it impossible to evaluate A/B (with/without) differences. Besides the DCS expensive stuff (upsampler Purcell and D/A Elgar) the PFA listening room was demonstrating with a Muse CD transport, a McCormack DNA2 power amp and a pair of Magnepan 3.6. Pretty rich environment, uh? A cheaper upsampler (selling for less than 600 $) is coming out from the North Star guys (now designers at Audio Analogue, too) and it is meant to work together with their Model 3 24/96 DAC already reviewed here on TNT-Audio. 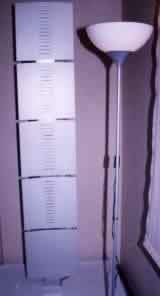 This upsampler can work up to 24/96. Still into the digital domain, I attended a pretty interesting seminar at the FdS (HiFi mag) room. The two speakers, Marco Manunta (North Star & Audio Analogue) and Marco Lincetto (Velut Luna records) presented a talk about the future of digital audio, explaining that the real limit is today represented by the loudspeakers and the amplifiers. With high resolution digital audio you can go very close to the limit of a perfect recording and reproduction. The problem remains the same: microphones and preamps during the recording process and the playback system during reproduction. Since high resolution digital audio will allow S/N ratios as high as 144 dB, Marco Manunta believes there will be no room left for tube preamps, normally too noisy for such applications. We'll wait and see, as usual. No doubt about this: the weirdest and wildest THING seen at the Top Audio was this pair of canoes (boats, gondola's...) by the Italian Company Pearl Audio technology. Here are some details: named Eliptica this loudspeaker is 2,3 meters tall (till the ceiling, that is), 80 cm wide and 1,7 meters deep (!!! ), its weight is around 130 kgs each (that's 300 lbs, dudes!). Flat honeycomb woofers and subwoofer (13" !!! ), two dome tweeters and cone midranges, placed in a reversed (!!!) D'Appolito configuration, individually multiconfigurable by means of a laser device that can place the acoustic focus of the 'speaker everywhere between 2,5 and 10 meters. The gondola is held in upright position by means of a large wood base which makes use of hydraulic decouplers. This wild set of wood and drivers costs, without sails and lifeboats or GPS, something like 90,000 US $ pair (ninety thousands bucks). Thanks God, Pearl Audio Technology was displaying something more affordable and down to earth (and floor :-) ), for example a pair of nicely priced (900$) bookshelf 'speakers named Preludio, that you can see at the right of the Eliptica. Also available a new center channel 'speaker called, guess what?, Central. The strange lamp which lies on the floor is a subwoofers instead, called Conebass and meant to be matched with the super-nice tiny bookshelf Celesta, at the left of the Eliptica here. Everything was driven with fine New Audio Frontiers Italian tube electronics. Let me also spend few words on the quality of the craftsmanship and finish of the Pearl stuff: it is simply outstanding, period. Another highlight of the Milan show was this pair of DIY loudspeakers designed for Suono (an Italian HiFi mag) by our resident 'speakers guru Giulio Nicoletti...you may have read about his tweaking session for a pair of Spendor SP2/2, published recently here on TNT-Audio. As you can argue from the picture, Giuliano used a single 83 mm (yes, Virginia, just 3"!!!) fullrange Fostex FE 83 driver inside a TQWT cabinet with added resonators inside. The price to pay for these weird babies should be around 250 $ (400,000 liras) for the whole DIY kit (not finished). The Suono Limes, that's the name of the weird baby, impressed more than one visitor, included Soundstage's Editor Doug Schneider....It came as no surprise to my ears since I knew that driver since my early days (well, almost) and I can assure you it is really outstanding. The most common question was: where's the subwoofer? Few visitor could believe the whole sound was coming out from such a smallish 'driver. The only thing you shouldn't try at home is driving them with a powerful amplifiers...actually a small 10 watts NVA integrated was in charge for the drivin' duties, together with some Audio Note Class Zero tube electronics. Also, since many audiophiles still don't know how to put things in the right perspective, someone complained because his B&W 801 sound better than the Suono Limes!!! To me, it sounds like this: I own a Ferrari but my friends are trying to convince me to sell it for a Smart citycar...but I still believe the Ferrari is better. Gosh. For more infos on this DIY kit you can directly contact our resident guru Giuliano Nicoletti who, incidentally, designs all the DIY loudspeakers which have been published here on TNT-Audio (and never translated into English because they make use of Ciare drivers, not easily available outside Italy). At the left of the Limes you can detect a smallish 'speaker, still a DIY kit from Suono, which makes use of a car stereo coaxial driver connected to an internal hi-quality power amp. Hence these 'speakers can be used whenever a line output is available (multimedia, Home Theater etc.). Still inside the Suono room a Garrard 401 vintage turntable was used to play some pretty rare LARGE 33 rpm Ella Fitzgerald pizza's. The Ultrasound room was quite interesting too. 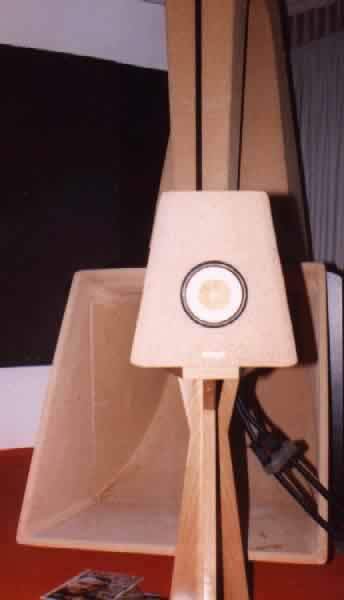 A double amplifier was used to demonstrate the pros and cons of current driving the loudspeakers. You may know that all the traditional amplifiers are voltage amps. Now the Ultrasound guys believe that current amplification is way better and hence they tried to prove this assertion. Rocket science and...genetic engineering here! The double amplifier had a switch (with a relais) that allowed to change "on the fly" the amplification mode: current or voltage mode. The 'speakers used were by Ultrasound (you may have read something about them in a recent listening test here on TNT-Audio) and a pair of KEF LS3/5A. Well, to be completely honest, I can't swear by the fact the current mode was better than the traditional one. Actually it seemed worse. Anyway, the listening room was so inadequate that judging anything this way would produce not serious results. A "controlled-conditions" test may reveal more. The fact the room was so poorly acoustically "treated" is quite strange tough. You may remember Ing. creazzo (Ultrasound's chief engineer) being very critic (and harsh) about the listening room of one of our reviewers (who didn't like his loudspeakers much, alas). So I expected the Ultrasound room to be perfectly damped and acoustically treated...and it was not. And there were similar rooms (for size and shape) which sounded way better (Miroir de la Musique or Audio Reference/Clearaudio, to name a few). And couldn't I mention these gorgeous weird A Capella loudspeakers here at your left? Into the HiFi Center listening room this pair of rocket-science engineered 'drivers could be listened from time to time, since demo sessions were scheduled at precise hours of the day. 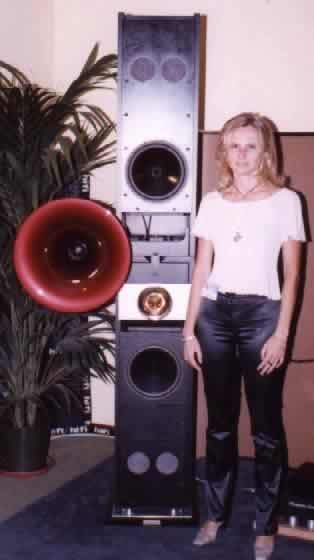 Seriously, I'd like to thank this very nice and kind girl who accepted to appear here close to the A Capella loudspeakers, just to give you dear and beloved readers an idea of their size (the girl was near 1,80 m tall - 6 ft for you non decimal guys out there). Actually, after I took 30 shots or something, the film inside my Yashica has misteriously disappeared...so I had to make it everything twice!!! 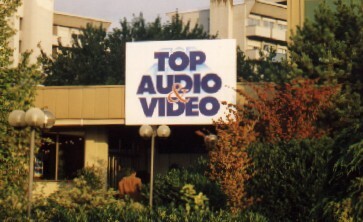 Even a group picture with several TNT-Audio readers outside the Top Audio & Video entrance has disappeared. We'll do better the next year, guys! The one you can see here below isn't exactly a modern-art lamp, at least not the one at the left...actually this is an example on how brilliantly solve the HiFi installation problems inside your home: five Linn Klimax power amplifiers are ready to delivered their brute (yet fine) power to a whole LINN AV system inside the Linn Italia room. We're talking of last-minute technology and fine engineering here since it seems the Scottish Company, renowned for the famous Sondek LP 12 turntable, is now aiming to push the hi-end envelope a little bit harder. Before there was the CD 12 - definitive - CD player, now the Klimax amps...and don't forget that Linn also makes some affordable stuff, such as the Linn Classik, an all-in-one HiFi component that just needs a pair of loudspeakers (the Linn Tukan, for example) to deliver good Music to the masses. The Classik, quickly becoming a...classic :-), is now available in different colors and includes a radio section too. If you will ever visit Linn Italia, say hello to Sir Antonio Trebbi, a kind, friendly and passionate audiophile. The first weird part of the reportage from the last Top Audio & Video in Milan ends here, just to leave some room for a second part, rich in contents and pictures, displaying some breaking news (if not so wild) from Italian HiFi Companies. Now just let me make a special mention for all the girls who worked inside the listening rooms: kind, patient and ready to gift you with a smile, despite the 5 long, tiring, boring days inside the Quark Hotel, surrounded by explosions into the Home Theater rooms and by audiophile searching for the ultimate brochure or depliant. Thanks for smiling, gals, you know who you are. Read the second part of this reportage!!! More exciting news and infos are going to be delivered right to your...desktop from TNT-Audio!